Top American ski jumper and 2013 world champion Sarah Hendrickson is gearing up for her return to the world’s biggest stage at next month’s Olympic Winter Games. The first woman ski jumper in Olympic history, Hendrickson is near peak performance after suffering two serious injuries to the same knee in 2013 and 2015. 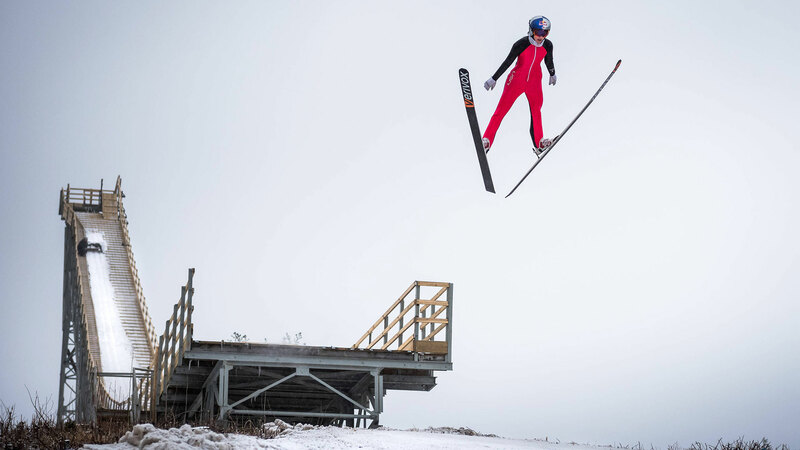 To announce her comeback to the sport of female ski jumping, Hendrickson took the final flight off the famed Nansen Ski Jump in New Hampshire last winter. The ski jump — which is more than 80 years old — had not seen flight in 32 years, but was restored for the sole purpose of having Hendrickson jump it one final time and officially close the historic New Hampshire state park attraction. Ahead of her trip to Pyeongchang, Hendrickson chatted to SheKnows about what it’s like to fly and how she ended up being the first female ski jumper in Olympic history. SheKnows: How did you first get started with ski jumping? Sarah Hendrickson: I started ski jumping because I was bored of watching my brother jump for a couple years. Ever since I was little, I was trying to keep up with him. I was also inspired by the 2002 [Salt Lake City] Olympics in my backyard, where I saw ski jumping on the world stage for the first time. SK: Can you describe what your first real jump was like? What was going through your mind? SH: The progression of ski jumping is very gradual. You start at such a young age that you do not really realize some of the risks — “Young and dumb,” I say. I have always loved getting a rush and remember just wanting to go on the larger jumps. I have never been scared at the top of the ski jump, and I think that is a major key in order to be successful in this sport. SK: What does ski jumping feel like? It looks like flying — is that how it feels too? SH: I compare it to sticking your hand out the window when you are on a highway. Moving it up and down, you can feel the lift and drag the airflow has on your hand. Ski jumping is like that but with your whole body. It is timeless, peaceful and exciting all at the same time. We really are flying and, yes, it is that cool. SK: How did you react when you found out you were going to be the first female Olympic ski jumper in history? SH: I saw that I was bib No. 1, and honestly was a little bummed ‘cause I wasn’t used to going at the first of the round — better-ranked jumpers usually went last, and the year before I was world champion. However, my teammate broke it down for me like, “Sarah, you are bib No. 1, meaning you will be the first ever woman to ski jump in the Olympics.” I guess that’s pretty cool. SK: Why do you think it took so long to get women’s ski jumping to the Olympics? SH: Ski jumping has traditionally been a male sport, and they excluded women for a long time due to medical reasons [and] safety — thus the lack of female athletes. They have never really stated the real reason, and there are much more dangerous sports out there. It takes a long time to break out of tradition. I respect the men and idolize the men in this sport, but I do not have control over being female and just want to compete against other females that share the passion. It is such a technical sport that we can be similar to the guys on a given scale, and I think that can scare a lot of the traditional men in the field. SK: What is the hardest part about ski jumping? SH: The mental side is the hardest part. Everything happens so fast, you have to go through years and years of muscle memory to teach your body and brain what to do. Every day is a challenge. SK: What advice do you have to girls who might want to try ski jumping? SH: Do it. There is a future. World Cups, Olympics, 18 other countries that have girls. The way is paved now. SK: What are your thoughts on the upcoming Olympics? How do you feel about your chances at a medal? SH: I do not really have specific goals for these games. It has been a really hard four years, and I am just thankful I am healthy enough to compete. I wake up every day dreaming, training and striving to win a medal, but at the end of the day it is just one day. Anything can happen.